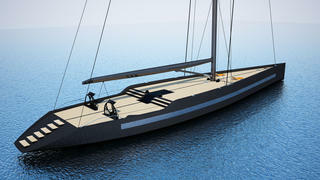 Genoa-based design studio Green Yachts has revealed its latest concept, a 40 metre sailing yacht called project Sussurro. The central concept was to create a yacht that combined luxury and performance with an easy sailing ethos, resulting in minimal crew requirements. This is manifested in the clean deck layout, which allows safe and easy navigation. Another key feature on project Sussurro is the telescopic keel, which would not enter the hull like a lifting keel would. This 40 metre yacht would be built from carbon fibre sandwich construction to provide the required balance between strength and lightweight performance. The interior features minimalist styling, with a series of zones mirroring the design of modern apartments. All of the deck surfaces and furniture would be built from Birmanian teak, which is highly scratch-resistant. 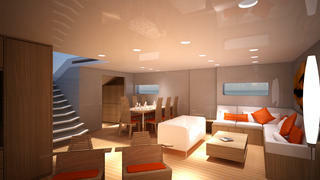 In addition to the master cabin, the layout features three queen-sized guest cabins and a single crew cabin. Exterior styling features a large hull window to enhance the levels of natural light on board, and a classic goose-tail stern shape with a stairway inspired by a fish’s dorsal fin. In an impressive design flourish, all of the deck furniture, from the chaise longue to the dining table, would fold away into the decking to create what Green Yachts calls a “ghost deck”. Continuing this theme, the two carbon-fibre rudder wheels are recessed halfway inside the deck. Other notable projects underway at Green Yachts include restyling of the Wally 94 sailing yacht and a redesign of the former US Presidential yacht USS Williamsburg.